Miyagikyo distillery is located in the foothills of the Miyagi prefecture near the town of Sendai. Built in 1969 it was the second distillery built by Nikka, following the Yoichi distillery in Hokaido. It took them three long years to find the ideal place for barrel ageing. The high humidity and purity of air is almost the same as in Cairngorms region in the heart of Scotland. Only the cherry trees are a reminder that the location is in the heart of Japan and not the Highlands. The distillery - one of the most up-to-date facilities in Japan - is using the old coffey still which dates back to the 19th century. A true blend of futurism and tradition. 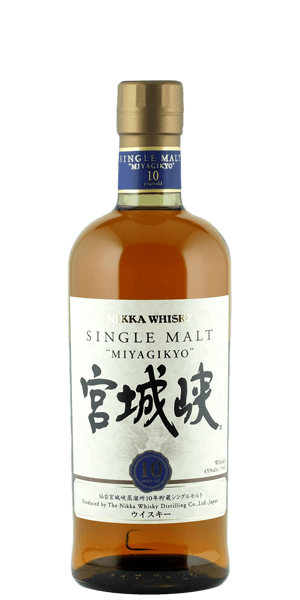 The Nikka Miyagikyo 10 YO is the least peated and malted single malt coming from this distillery. They use maize as the main source for malt and not wheat as they usually do in Scotland for blended Whiskies. A really smooth dram that can be put side-by-side with the infamous Speyside Whiskies without realizing you’re drinking Japanese Whisky and not Scotch. What does Nikka Miyagikyo 10YO taste like? The Flavor Spiral™ shows the most common flavors that you'll taste in Nikka Miyagikyo 10YO and gives you a chance to have a taste of it before actually tasting it. A light and pure nose that consists of lemons, oranges and floral scents mixed with a bit of maltiness, caramel and cocoa all in a nice harmony. Smooth and silky palate with oak character prevailing over tones of sweet, spicy and citrus. An intriguing palate indeed. Moderate in length and dry the finish brings out the concentration of oak and spices.